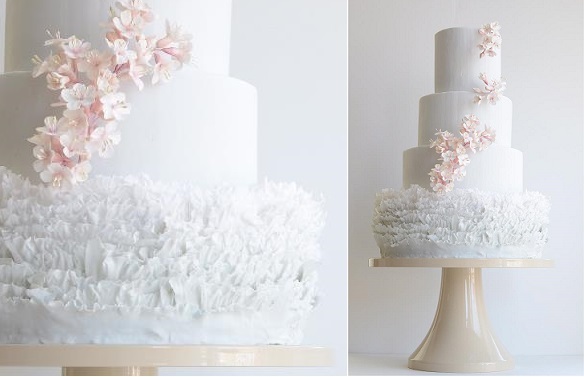 The second part of our Ruffle Wedding Cakes series focuses on fondant frills, a design that has soared in popularity largely due to the exquisite designs created by acclaimed US designer, Maggie Austin. Fondant frills come in many different styles but it is Maggie’s super frilly, delicate designs that are top of bride’s lists right now. The exquisite example above showcases exactly what makes this design so sought after – delicate, romantic frills enhances with tiny frilled blossoms and ruffled sugar peonies with pearl centres (image by Morgan Trinker Photography via Style Me Pretty). 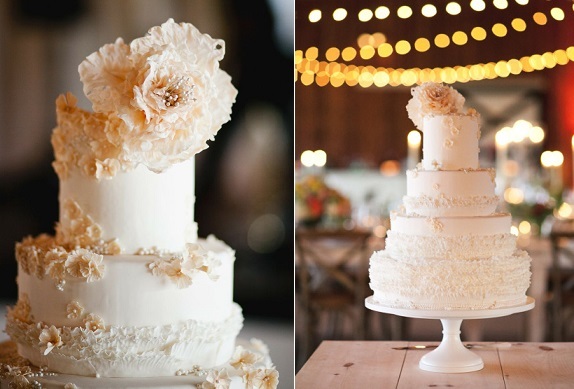 Top German cake designer, Pasteles Alma have created the stunning wedding cake below combining soft frills and vintage lace with blush pink peonies for a superb wedding cake design. 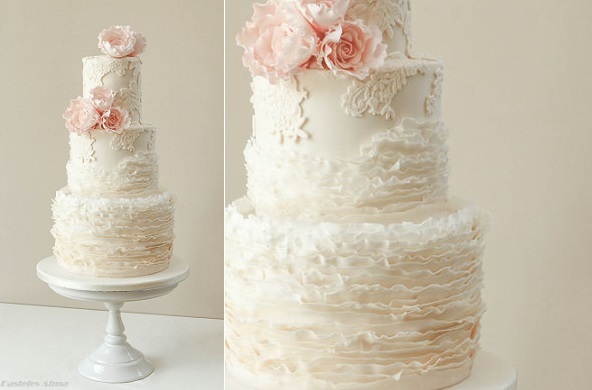 Florida’s famed Pastry Studio has created their own unique take on the fondant frill design with gentle ruffles layers creating an almost peeling effect for a beautiful antique look, in ivory and pearl palettes below. 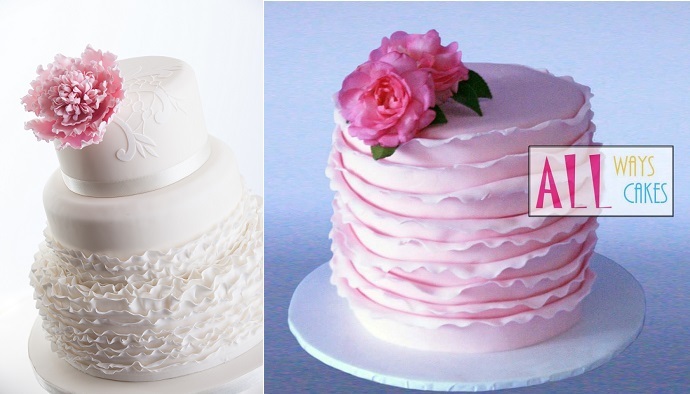 Fondant frills make an excellent side design for a special occasion cake also with the pretty peach and soft pink cakes below by Minnies Sweet Creations, left and by Maggie Austin Cake, right. The incredible details of a Maggie Austin’s design can be seen in the close up of one of her signature designs below. 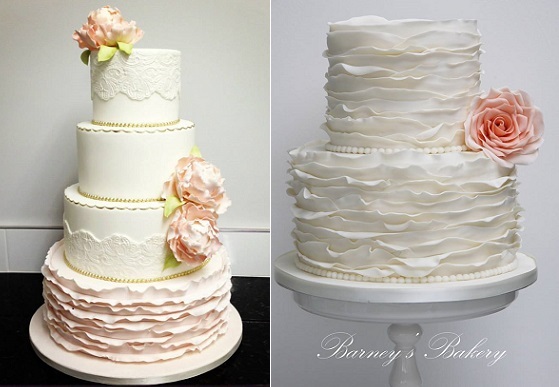 While the fondant frill is a contemporary new trend in wedding cake design, it combines wonderfully with lace and pearl accents to create superb vintage style wedding cake designs, with two beautiful examples below by Luisa Galuppo, left and Barney’s Bakery UK, right. 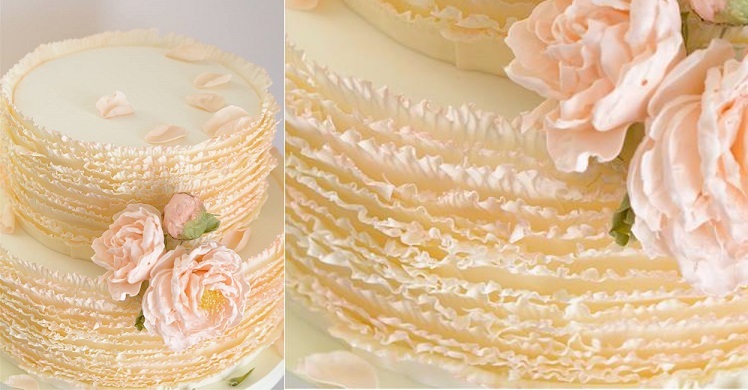 To help you create your own fondant frill cake design, you’ll find a tutorial here by Porsha Kimble: fondant frills tutorial. An asymetrical floral sash is combined to brilliant effect with fondant frills in the exquisite wedding cake below by Cake Zen. 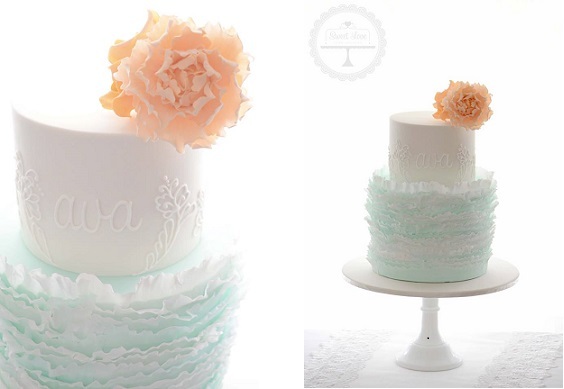 Australia’s Sweet Love Cake Couture have created the pastel beauty below is tranquil shades of watercolour blue and soft peach, with lace piping and a ruffled offset peony. Our final Maggic Austin design is one of our all time favourites in her wedding cake collection – gentle ombre shades of the palest blue-grey and a delicate cascade of cherry blossoms for a superby pretty wedding cake. 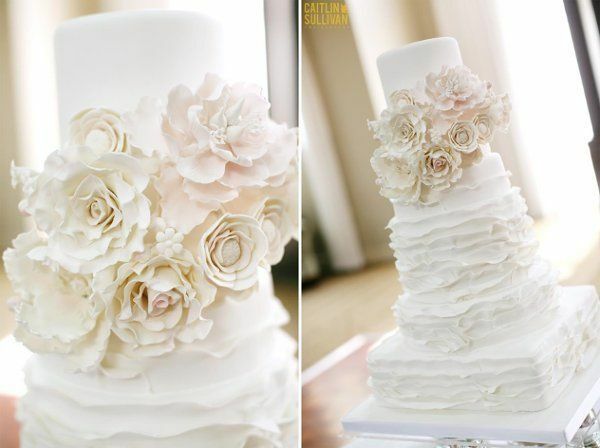 Peony roses are definitely the flower of choice for decorators when it comes to accessorizing fondant frills, with a beautiful ruffle wedding cake design below left by Northern Ireland’s Cake Couture (image by Chris Semple Photography) left and a single tier design in contrasting shades of pink by the inspiring All Ways Cake, below right. 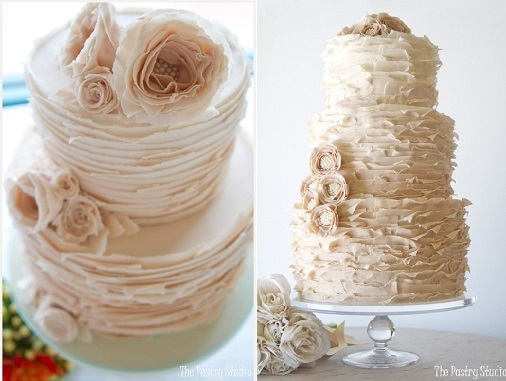 Learn from the master herself, Maggie Austin, her signature fondant frill techniques, including her gumpaste cabbage rose tutorial, plus lots of tips from Maggie on her design philosophy in her Craftsy class below. 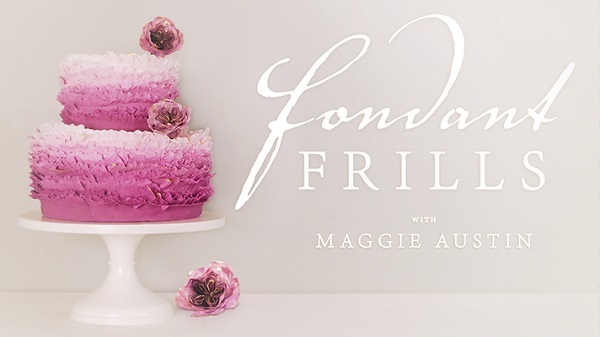 You’ll find all the details here: Fondant Frills Tutorial with Maggie Austin. Readers might also be interested in Jessica Harris’ textured effects tutorial here where you’ll learn how to create the four fabric effect designs below plus lots more textured effects in fondant. Find out more here: Elegant Techniques with Jessica Harris. 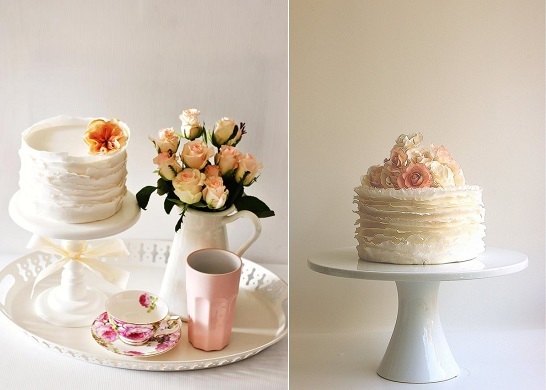 Check out Cake Geek Magazine on Facebook for more inspiration on cake design trends.